This book brings James Dunn's magisterial "Christianity in the Making" trilogy to a close. "Neither Jew nor Greek" covers the period following the destruction of Jerusalem in 70 c.e. and running through the second century, when the still-new Jesus movement firmed up its distinctive identity markers and the structures on which it would establish its growing appeal in the following decades and centuries.Dunn examines in depth the major factors that shaped first-generation Christianity and beyond, exploring the parting of the ways between Christianity and Judaism, the Hellenization of Christianity, and responses to Gnosticism. He mines all the first- and second-century sources, including the New Testament Gospels and such apostolic fathers as Ignatius, Justin Martyr, and Irenaeus. Comprehensively covering an important, complex era in early Christianity that is often overlooked, "Neither Jew nor Greek" is a landmark contribution to the field." Neither Jew nor Greek by James D. G. Dunn was published by William B Eerdmans Publishing Co in January 2016 and is our 37970th best seller. 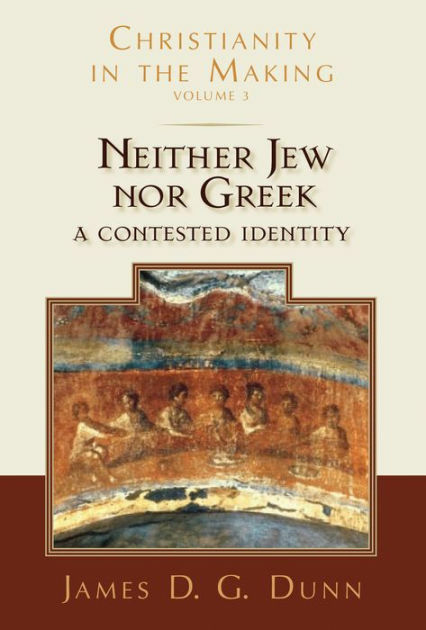 The ISBN for Neither Jew nor Greek is 9780802839336. Be the first to review Neither Jew nor Greek! Got a question? No problem! Just click here to ask us about Neither Jew nor Greek.